As I mentioned before, being healthy is not just about working out and eating right, but being physically, mentally, spiritually, and emotionally healthy. 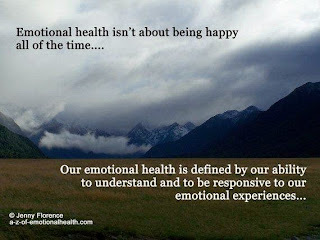 I've discussed in prior posts this week the first three, and now I'm ending the week with what it means to be emotionally healthy. I saved this one for last because I believe the others all tie into your emotional state and health. So, what do I mean when I say emotional health? I’m talking about how you react to certain situations or events. Do you get angry, sad, happy, excited? We will have days when we have things come up that we don’t plan or even don’t like. But, how we react to those situations plays a big part in our physical, mental, and spiritual health. If our reaction is anger or frustration, and we allow that emotion to control us, and we allow that emotion to control us it will carry over into our day and other parts of our lives. I’ll share one of my personal examples. I get to work, and something out of my control, happens that upsets me. If I allow that anger and frustration to control me, which I do tend to allow to happen, it carries over into my day and how I approach work, my workouts, my family when I get home, and just how I react to people in general. By allowing that emotion to control me, I get stressed and tend to become short with people who actually have nothing to do with the original situation. And the stupid thing is, it's typically over something I have no control over. Now, these past few weeks I've been doing a lot better about controlling my reactions. Yes, I still have things happen that frustrate or upset me, but I'm not letting that emotion control me. I'm doing my positive focuses and approaching the situation with a "Okay, what do I need to do to move forward?" I look at my other options and focus on the things I can control. More importantly I don't dwell on it and am able to, not only handle that situation more effectively, but I'm approaching the rest of my day more positive and in the right mind set. The quote I found above I thought was a perfect way to view what it means to be emotionally healthy. I believe when we can recognize those situations that trigger those negative emotions, we can adapt better to how we respond and we are able to move on to a better and happier emotional place.